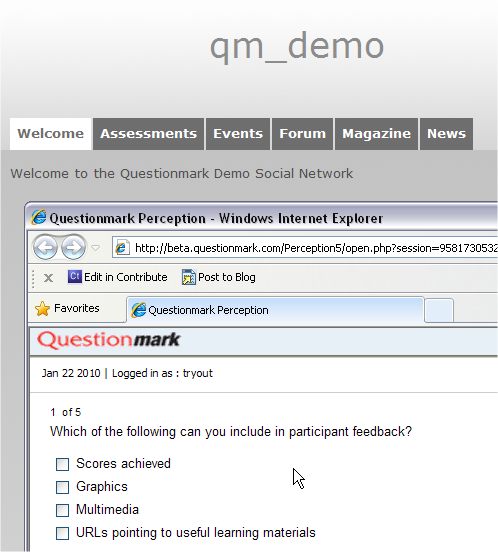 Embed a Questionmark Perception assessment, survey or quiz within SocialGO by creating an “Assessment” tab. To see how this would look, see a snapshot of an assessment embedded within a SocialGO page. SocialGO is a British service that allows users to build their own online social networks around a personal topic or interest. It is not possible to embed an assessment directly into a SocialGO Web site unless you are paying for their full subscription membership. However, you can easily assign one of the available navigation tabs within your site to link directly to an assessment. I’m pleased to say that the supported edition of Questionmark’s Moodle Connector is now available to download from the Questionmark Web site . 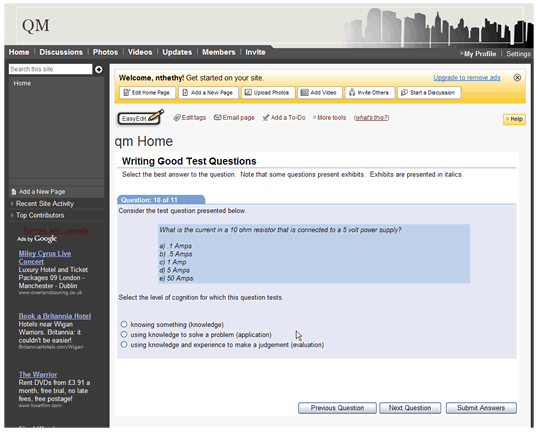 Connector integrates Questionmark Perception with the Moodle 1.9 open source course management system so that users can link Moodle courses to Perception course evaluations, quizzes, tests and exams. The supported edition of the connector represents a milestone in the development of the Moodle Connector, which was the first of our integration products to be made available as an open source community edition during development. I’d like to thank everyone who has tested the community edition of the connector. With your feedback we’ve been able to get the features of the connector right for this first supported edition. Of course, development does not stop with the first release! We’ll continue to develop the Community Edition as part of our Open Assessment Platform initiative. Embed a Questionmark Perception assessment, survey or quiz within Microsoft Word. To see how this would look, see a snapshot of an assessment embedded within Microsoft Word. 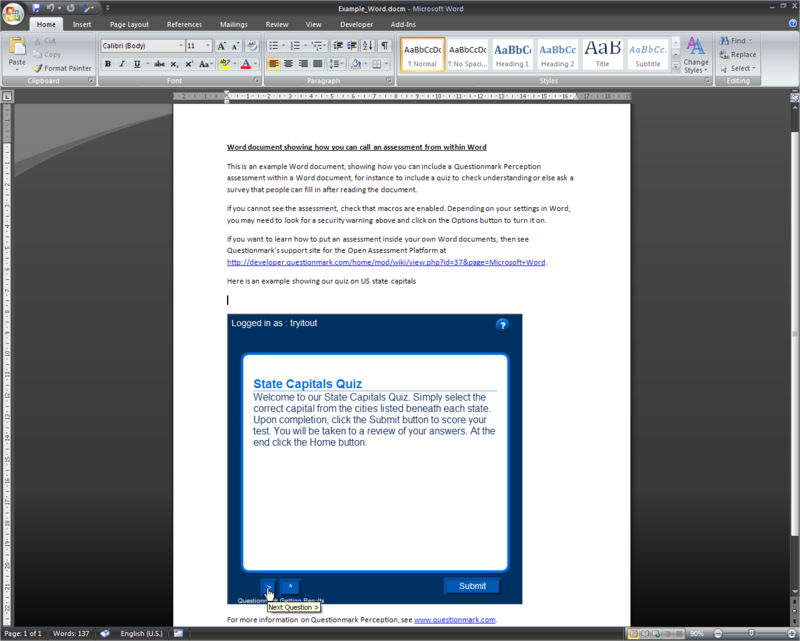 You can embed an assessment in Microsoft Word using the Visual Basic for Applications Web Browser control. It is important to note that embedding an assessment uses certain VBA controls. You will need to ensure that Macros are enabled when viewing the document with the embedded quiz.